This architectural definition is indeed a metaphor for mezzanine debt’s function in real estate finance. 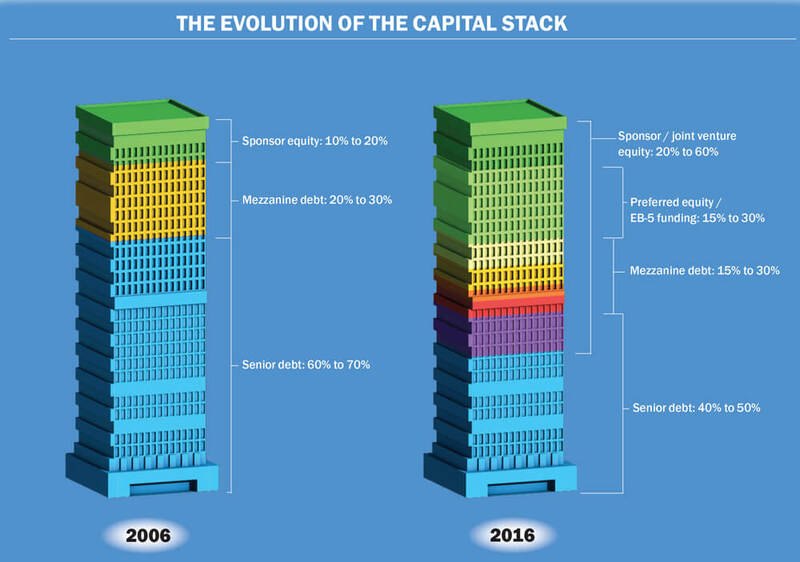 If one visualizes the capital stack as a building, the mezzanine loan sits in between a senior loan (the ground floor) and the equity above. This financing instrument “bridges” the senior debt and equity, typically accounting for 5-20% of the total capitalization of the project. In the right profile of commercial real estate project, mezzanine debt can offer flexibility and enhanced overall return potential to the borrower, while offering an attractive fixed rate of return to mezzanine debt investors over a relatively short investment term. Mezzanine debt is (typically) subordinate to the senior loan, but senior to all equity. In some investments (including a recent EquityMultiple offering) mezzanine debt can be paid down pari passu with senior debt after the senior debt is paid down to a specific threshold. As such, it typically offers a higher rate of return than senior debt. However, mezzanine investors typically have limited upside potential, given the downside protection offered by virtue of their position in the capital stack. Simply put, mezzanine debt offers the potential for strong risk-adjusted returns, particularly late in the cycle when common equity investments may carry a higher degree of risk (despite their uncapped upside potential). Mezzanine debt is one of several bridge financing options available to borrowers, along with junior debt, preferred equity, and other debt instruments. Like preferred equity, mezzanine debt carries a shorter term (typically between six and 24 months). Mezzanine debt most often entails a pledge of the sponsor and/or developer’s equity stake in the project. So, in the downside scenario of a default by the borrower, the mezzanine debt investors can foreclose on the borrower’s equity interest and assume the day-to-day management of the project. While mezzanine debt offers payment priority, the risk factors are similar to any other debt or preferred equity investment: investors should consider the experience of the borrower (the real estate firm executing on the investment), the quality of the underlying asset, and the strength of the market. Mezzanine debt investors should pay close attention to the overall leverage of the project across senior debt, mezz debt, and any other bridge financing. The total loan-to-value (LTV) and debt service coverage ratio should remain appropriately conservative relative to the offered rate of return (the interest rate). EquityMultiple is committed to offering commercial real estate investments across the capital stack, including mezzanine debt. If you haven’t already, please create an account in order to browse current and past investment opportunities.